I am reading ur articles - with less understanding into its depth. But it gives me pleasure. Some weeks back, you were writing on LATHANGI on metro plus and in that essay I was very keen in raga's resemblance to one that kalyani. Many a times I have a confusion since most of the swaras are adjustant to that of kalyani. Adatha manamum undo - song in Mannathi Mannan is said to be in lathangi but for a learner or fresher it seems just like kalyani. During one of the concerts of Unni Krishnan, the alaabana I observed it seemed to be kalyani - only after his krithi Pirava varam tharum I came to know it is lathangi. OK for a scholar to distinguish the job will be easy. Anyhow you have to admit both kalyani and lathangi have similar notes to certain extent and it varies by this and that. I was very particular on this in your essay on the other day. Am I correct, madam ? Next Isai Payanam, when it is scheduled and where ? I enjoyed reading it in The Hindu last Saturday. On Friday evening I saw a show where you are talking with Usha Uthup. Next time you interact with Usha, tell her that her uncle is your fan! This lay listener has been seeking to find out why carnatic music sounds so beautiful for a very long time. 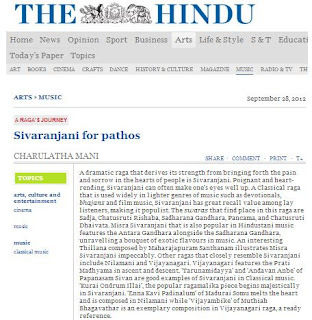 A big fan of Illayaraja (though I became one much later). I have absolutely no training in music and my wife thinks I am tone deaf too. Your articles and youtube videos are godsend gifts. Listening to your videos puts a smile (pun muruval) on my face - such is the beauty of this music and such is the importance of your mission. Now I am in the process of compiling playlists under raga names both Carnatic and film based. Its PantuVarali and ReetiGowlai to begin with. Can't have enough of them. Thank you and please continue to keep us educated/entertained. blog sangatis for different ragas which shall help one to build up alapana and later manodharma. i am working as district collector , kadapa in a.p. and learng violin for the past 4 yrs. On which raaga is the song "aadatha manamum undo" ?